HOME > TERM > What is a TNF? Much has been discovered about the functions of white blood cells in the past ten years. have been one such discovery. These are a biologically active substance produced by white blood cells and it has been discovered that they do the work of white blood cells. Recently, it has become possible to infer the function of white blood cells if the amount of cytokines is known. Like vitamins, there are around 50 types of cytokines. TNFs are one type of these cytokines. 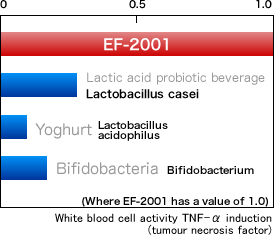 As the name tumour necrosis factor implies, TNFs released by white blood cells work to destroy cancer cells; in fact, TNF attack is considered to be a vital step for white blood cells to kill cancer cells. TNFs also work on various immune cells as well as cancer cells. For instance, if you are injured, TNFs stimulate fibre cells to grow and repair the wound; if you get a cold, they induce fever and sleep and work to remove the virus or bacteria. White blood cells are responsible for our immune defence responses. While many animals do not have red blood cells (for instance, if you cut an octopus or squid, it would not bleed), all animals have white blood cells. All animals have macrophages in their white blood cells. To put it simply,macrophage cells are fundamentally important. Macrophages are known to function due to a very small amount of immune hormones called cytokines. While there are many cytokines, one typical one is the extremely important TNF.